SFC Wendell Thompson was born in Salinas, California in February 6, 1959. He enlisted in the U.S. Army in 1976. He entered the airborne infantry where he remained until he went into the Army Reserves. 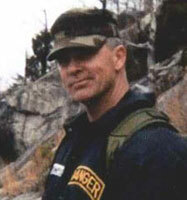 While serving with the 101st Airmobile Division, Wendell participated in establishing the division Pre Ranger Program. Her served as an instructor under the Air assault School. He was the primary instructor for the 6th Battalion CIC and mountain training while stationed at Fort Campbell. Wendell served as a Ranger Instructor with the 5th Ranger Training Battalion at Camp Merrill. Wendell was part of a twenty-man mountaineering training team and was cross-trained in and qualified to instruct the 15 Team raid, ambush, and recon classes. Wendell was a quiet man with many talents and was not one to brag about his military accomplishments. Throughout his military career, Wendell continuously enrolled for training program the military offered. Wendell Thompson was a true professional and was extremely proud of his many accomplishments. Wendell David Thompson passed away on August 13, 2014 at his home in Dahlonega, Georgia. He is survived by his wife of thirty-three years, Linda and three sons: Jeb, Seth, and Jeremiah.